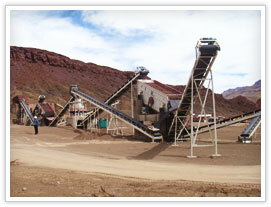 Complete stone crushing line including stone crushing machine, vibrating screen etc. The 550t/h aggregate stone crushing machinery line in Australia, which Jay required, is for road building in Wagga Wagg in the south of Australia. Jay works in Burgess Earthmoving Pty Ltd as the purchasing department manager. Burgess Earthmoving Pty Ltd is the company mainly operating successfully for over 30 years & providing services to industrial, government, mining, commercial & residential sectors and serving Albury, Wagga Wagga & surrounding areas. In 2009 they bought a crushing plant consisting of a 900x1060 jaw crusher 16x6 twin deck screen and 4ft cone crusher producing 20mm road base. But found that cone crushers output does not match that of the rest of the plant. Meanwhile, they were also looking to set up a tertiary crushing plant to produce aggregates. SBM found the supply-demand information in a B2B website and contact them. Finally, SBM supplied Burgess Earthmoving Pty Ltd the 550t/ h aggregate stone crushing machinery line. According to the requriements from Burgess Earthmoving Pty Ltd, SBM design this stone crushing line with vibrating feeder, stone crushing machine (jaw crusher series mobile crusher), vibrating screen and belt conveyor. To meet the capacity requirement, SBM choose the PE-1200X1500 jaw crusher model as the main crushing equipment in the mobile jaw crusher. Meanwhile, we applied ZSW-600X1300 series vibrating feeder and the vibrating screen with relevent capacity. Finally, the Burgess Earthmoving Pty Ltd were happy with the configuration.